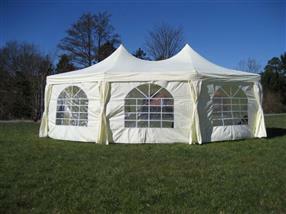 Other Description:: 16' X 22'MarqueeTent: Total area 320 sq feet, White powder coated frame works. Rip stop PE water resistant. UV retardant covers, 8-sidewalls, 7 sidewalls with windows, one sidewall zipper door. 8 sidewall curtains.